Two teams are asked to perform the same challenge given by the show’s host. You, the audience, will judge the action! 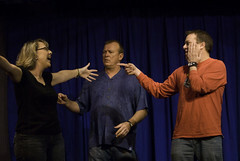 Our shows are a fast-paced mix of scenes, improv games and music. If you like Whose Line Is It, Anyway?, you’ll love us! Our shows are recommended for ages 12 and above. The performance lasts approximately 1 hour, 45 minutes. Reservations are not needed for our regular Fri/Sat shows, but you are welcome to reserve.